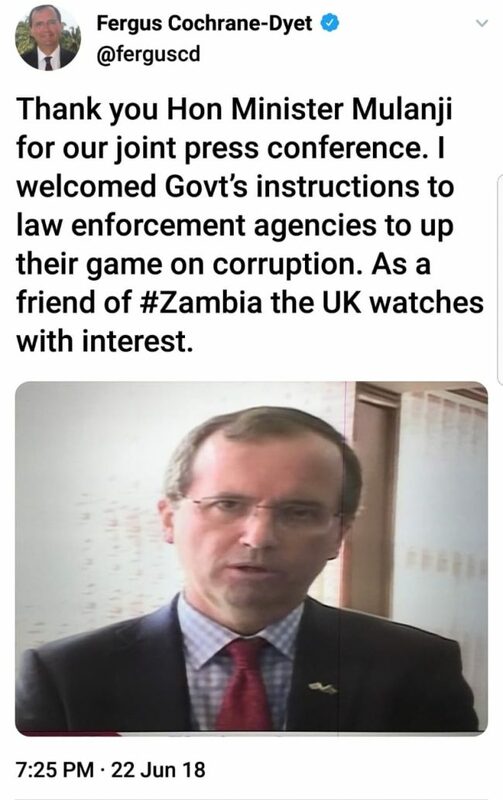 British High Commissioner to Zambia, Fergus Cochrane-Dyet says the United Kingdom is watching with keen interest Zambia’s fight against (or lack of it)corruption. Cochrane-Dyet says his government has welcomed the decision to submit to law enforcement agencies the Financial Intelligence Report 2017 Trends Report. Malanji summoned Cochrane-Dyet for his strong tweets against government and its officials over corruption and governance issues. Malanji accused the High Commissioner of using irregular channels to air his grievances. But at a joint press conference with Malanji at Foreign Affairs Headquarters, Cochrane-Dyet blamed social media and the Zambian Watchdog for his troubles. “It is important to look at what I said in these tweets rather than look at what others have said I said.” He explained. “Actually look at my Twitter feed and you will see for yourselves what I said. But I do express concern about corruption, of course I do, it is very important. The British taxpayer is investing money in development in Zambia, it would be a very serious matter if some of that money was misappropriated.” He said. Cochrane-Dyet said there was a corruption problem in Zambia. He said he was excited to learn that President Edgar Lungu had asked law enforcement agencies to up their game. ” And investors, they need confidence to invest in Zambia and there is a corruption problem in this country and it is quite serious..and the information which the minister has shared with me just now is very reassuring and is very welcome,” High Commissioner Cochrane-Dyet said. He said it was unfortunate that the Zambian Watchdog had misconstrued his tweets to cause a row. He accused the online newspaper of driving a wedge between Zambia and the United Kingdom. “So reports about my tweets and my meeting at FIC have been distorted very much. And in particular, I think it’s the way in which my reference to the Honorable Minister of Information was manipulated by changing punctuation to suggest that she is a minister of misinformation when actually, the misinformation was about Zambian Watchdog. ” The Honorable Minister and I have talked about the Financial Intelligence Center and we have talked about government’s efforts to tackle corruption.